Gold is not an investment - it's an insurance and the anti-currency. Gold is unlike most investments. In fact we would argue that it’s not an investment at all. But many people consider it to be one, so let’s examine its characteristics, and work out what to do with it. First, a bit of history. Gold appeared on the world scene when the Egyptians began making jewellery from it, in around 3000 BC. More than two thousand years later, it became de facto money as merchants started to use the jewellery in trade. Then the Greeks and Romans made coins from it, followed by the European colonial powers, including England (Britain). Later, coins – and then notes – began to represent a claim on some gold, stored in an official vault, rather than being a piece of the metal itself. Under the Bretton-Woods agreement at the end of World War II, the dollar was pinned to gold at $35 an ounce. But in the 1960s the French worried that the Americans had issued more dollars than they had gold to back them. They and other European countries began to exchange their dollar reserves for gold. The gold standard was abandoned in the 1970s and the price of gold rose dramatically (making US reserves worth more than the dollars in circulation). Now all money is fiat money, simply declared by a government to be legal tender. Today gold is largely used for jewellery, though around 20% of the total supply is held on deposit by the world’s central banks and international financial organisations, such as the IMF. Gold has good points and bad points. Let’s start with the good things. There are three of them. The first good thing is that returns are poorly correlated with equities (including UK equities, which we are particularly interested in). That means that it can be a useful diversifier. The second good thing is that gold is a good store of value over the long-term. Unfortunately, we really do mean the long-term. It’s been a safe store of value for thousands of years, in contrast to all forms of paper money to date. But over 10 or 20 years – depending on the price you buy in at – it can be very poor value indeed. And just because it beats cash as a long-term store of value doesn’t mean it beats all other assets. When people lose trust in paper money, they often turn to gold as a substitute. But let’s not exaggerate the benefit here. We’re talking about semi-Doomsday scenarios, where petrol, beans and bullets will also prove very useful. Gold becoming the de facto currency is not something I want to look forward to. Now on to the bad things. Again there are three of them. The first problem with gold is that is has no uses. This is an exaggeration, as it is used in electronics, and would be used a lot more if we hadn’t decided that it was so expensive. But you get the picture – it’s a lot less useful that its price would indicate. In particular, it does not get used up, so all the gold that has ever been produced is still available to satisfy future demand, should prices rise. Thus it has no intrinsic value – you can’t eat it, power a vehicle with it, or derive anything useful from it. The second problem is it pays no income. Companies make money each year (we hope), and they share some of that money with us as investors. Gold not only makes no money, it can cost you money – to store and insure it, in the case of physical gold. A side effect of the lack of income is that there is no way to arrive at a “fair value” for gold – it is worth whatever someone will pay for it, and it is difficult to value against other assets other than by historical comparison. One approach to valuation is the cost of production – supply and demand should ensure that over the long-term this will be the floor price for the metal. Gold bugs believe that the price of gold should make US reserves worth as much as the dollars in circulation, or alternatively the value of US debt held by foreign investors. The third problem is that is introduces currency risk, of a sort. Gold is priced in dollars, so if the dollar moves, so does the gold price. More specifically, if the dollar moves against the currency in which you hold most of your wealth – sterling, for most UK private investors – so does the value of your gold. Over the long-term, this may well be a wash, but if you anticipate that your currency will appreciate against the dollar, beware that it will also appreciate against gold. Via ETFs, ISAs and SIPPs, these problems have now been eliminated. Gold has not recently been confiscated by a UK government. Another rule of thumb is that if you are worried about where the gold price is headed – if you even know what the price of gold is – then you have too much gold. The next question is how should you invest in gold? So why is it the anti-currency? Gold would really come into its own in a situation where several countries became embroiled in a currency war, or competitive devaluation. This is particularly the case where the dollar is involved. In that scenario, gold is not only a safe haven, it’s the currency in which other currencies are valued. It’s the currency that isn’t controlled by a single government or central bank and won’t be competitively devalued – the anti-currency. 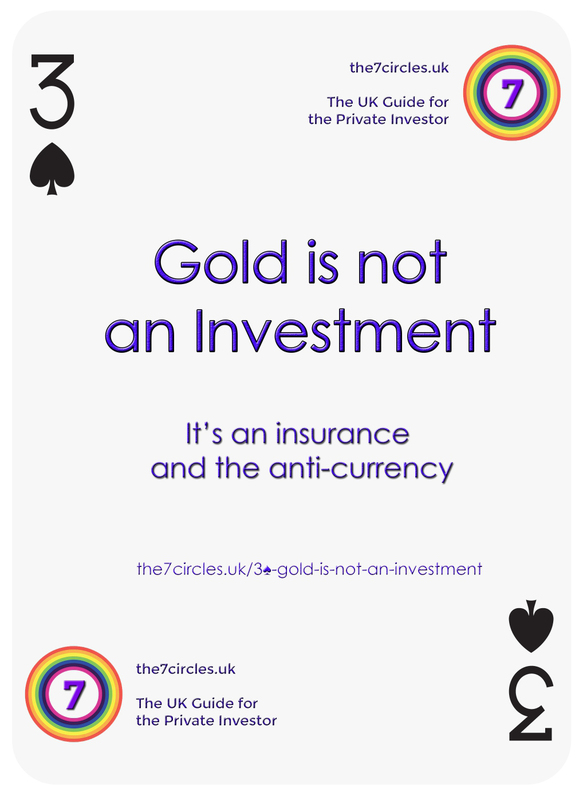 So remember – gold is not an investment – it’s an insurance and the anti-currency.